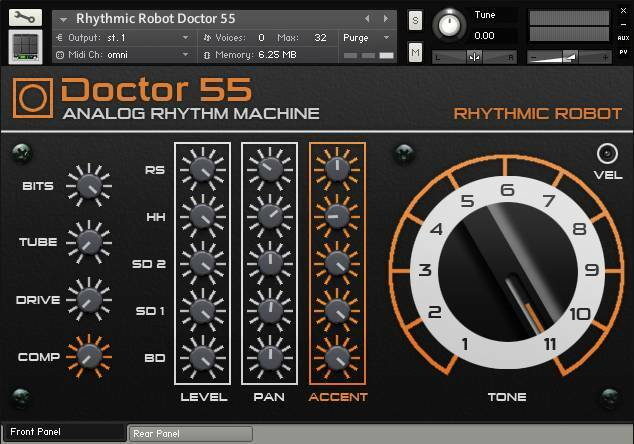 Doctor 55 is the Rhythmic Robot take on the DR55. We’ve sampled every kit piece individually at 24bit, through the entire range of the Accent knob. You can control how much Accent each kit piece gets either from the front-panel knob (individually – set what you want for snares, hats, kick and rimshot); or you can vary the Accent level with velocity using our “Velocity Retrofit”. This enables really varied, expressive playing right from your MIDI keyboard (or you can draw in velocity variations in your DAW) – and it can really bring the instrument to life. We’ve also found the solution to the Short Snare issue. The inbuilt snare sound of the DR55 is actually quite cool in its character, but it’s very short and that limits its usefulness. However, we fiddled around and found a way to get the instrument to glitch out a longer snare. There you go: a second snare sound, sampled alongside the original, with its own Attack and Decay controls hidden on the back panel of the instrument. 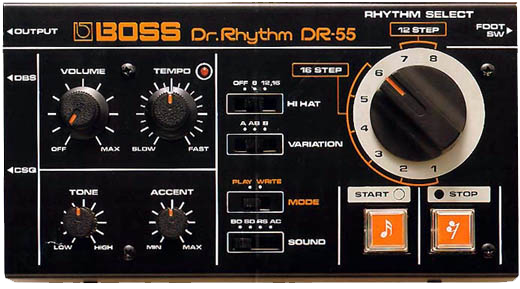 This gives you access both to the authentic DR55 snare, or your own version of it – perhaps with a longer decay, or a slower attack for a “brushed” sound. Your call! Plus, there’s a UFO on the back panel too, because you can never have too many UFOs. Of course, you also get individual control over kit piece levels and pan positions, and a raft of signal processors to pump up or grunge out your beats: bit crusher, tube saturation, distortion and output compression are all right there for the tweaking. It’s great to hear this little beatbox get really snarly with some Drive and Comp dialled in! This sounds fantastic! The second snare brings it to the max! I love it! FUNKY! I used to own one of these. I bought it from a Cash Converters in Australia for about $10 and then lugged it halfway around the world for a few months. It never really worked properly and had the fiercest crackle I had ever heard, but I loved it. Now this comes along and instantly makes the original hardware redundant by adding saturation and compression to tame the sizzle (if you want to) while retaining the look and feel. Lush! Ran some effects on this and sounds fantastic so easy to create good sounding beats. I know – The Sisters of Mercy acquired an Oberheim DMX for the album that features FALAA, but this was the first Doktor in the house of Eldritch. So many classics were done on this one. New Order, Thomas Dolby, The Cure. 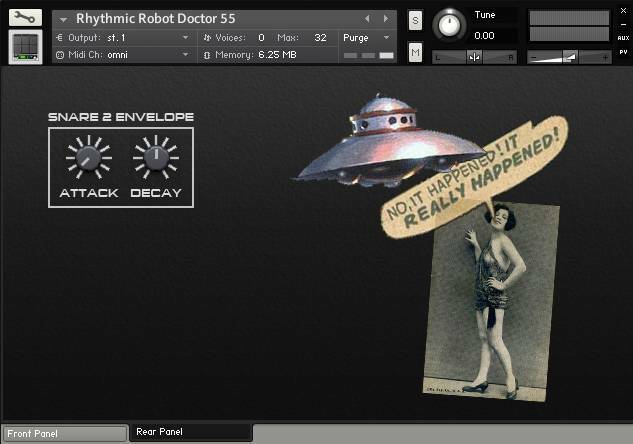 All used to great effect and sounding even better here by Rhythmic Robot thanks to the added features. I owned one of the real ones and even though the sounds were kinda mickey mouse, even in the day, you could feed it into a guitar amp (yes, really!) and get some great sounds from it. Of course these days put the RR plugin through a few FX and voila, the little big man 🙂 It’s great to have this back in the arsenal.